The hilyah, or hilye-i sherife, is the verbal description of the physical characteristics of the Prophet Muhammad, as recorded by his son-in-law and cousin, ‘Ali ibn abi Talib. Its diagrammatic form, attributed to the Ottoman calligrapher Hafız ‘Osman (d 1698), presents the text in a central roundel, often outlined by a crescent, enclosed in a rectangle. The text continues in an oblong panel at the foot of the page. At each corner of the central rectangle are cloud panels with the names of the Orthodox caliphs, and above and below are panels of inscription, normally the basmalah and one or more Qur’anic verses. The writing of the hilyah was a work of piety, but it was also designed to evoke reverence in the viewer, and may have had amuletic properties [see MSS 759]. 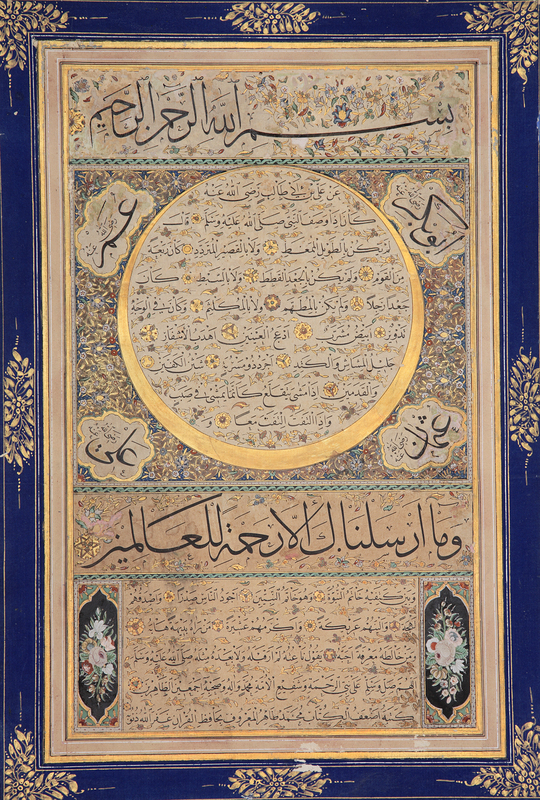 Mehmed Tahir (d 1845), who signed this piece, was one of the most brilliant students of Mahmud Celalüddin, and is said to have even surpassed his teacher in writing the monumental or jali scripts. 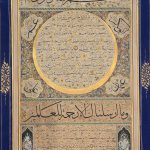 His fame and skill were such that later in life he became the calligraphy master of Sultan Abdülmejid I (r 1839–1861) and then of the children of Sultan ‘Abdülhamid II (r 1876–1909). N.F. Safwat, The Art of the Pen. Calligraphy of the 14th to 20th Centuries, The Nasser D. Khalili Collection of Islamic Art, volume V, London 1996, cat.30, pp.56–7. J.M. Rogers, The Arts of Islam. Masterpieces from the Khalili Collection, London 2010, cat.281, p.245.